On Oct. 25, 2013, about 70 visitors explored the history of Huron, heard about an 1861 troop train crash, the murder of a beloved O & M railroad stationmaster, the gruesome death of a regular lawbreaker. Re-enactors shared tales of what happened at each site. Soup and sandwiches were provided by Huron's WTK Club, and Believe Paranormal presented a short presentation on the strange sights and sounds found at a local Huron bridge. Re-enactors brought "Huron Haunts" to life. l-r: Greg Baker as Jesse, a working man from 1910. Aaron Baker as Elmer, a working man from 1910. Lisa French as Eleanor, a local Huron woman in 1920s. Abigail Natalie Gentry as Mrs. Kerlott, a young wife during the Civil War. Arthur Cross-Najafi as Lieutenant Kerlott, a young Union officer. Lewis Maudlin as Jim Terrell, a working man in his 40’s in 1886. Becky Buher as Ida, a local 1920’s Huron woman. Adam Roberts as George Wolford, an 18-year-old man in 1886. 1. 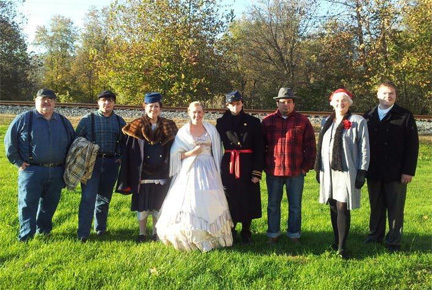 A HISTORIC WALK with costumed re-enactors, beginning at the Huron firehouse. 2. A delicious SUPPER of soups, cornbread, and other good things, prepared by the 90-year-old Huron WTK Club. 3. A HAUNTED TALK by Believe Paranormal about their investigations into Huron sites. "On behalf of the Lawrence County Museum of History, I would like to thank the following for their help in making this year’s Halloween fundraiser, “Huron Haunts”, a big success: The Huron WTK Club for a wonderful meal; the Huron Volunteer Fire Department for the perfect venue; Little Theatre of Bedford, particularly Reida Cummings, for costume support; Believe Paranormal, particularly Trenton Scott, for a spine-tingling presentation; Joyce Mundy for her help with the dinner and research on Huron history; Jeff Routh and Jim Buher for their expert narration; Emily Engstrom for recording the entire historic walk; Barbara Bayens, Joyce Shepherd, and all our museum front desk volunteers for their help in selling tickets and greeting visitors, and our talented cast of re-enactors for bringing Huron history to life. The cast is shown in the picture, left to right: Greg Baker, Aaron Baker, Lisa French, Abigail Gentry, Arthur Cross-Najafi, Lewis Maudlin, Becky Buher and Adam Roberts."